Canoe School is a collaboration between Paddle Manitoba and Manitoba Pioneer Camp to provide Paddle Canada certified instructor-level training and skills courses. Each year, the school offers Lake Tandem Instructor training and a varying selection of skills and upper level instructor certification. The skills courses provide a challenge for those wishing to move beyond simply paddling a canoe. What is Canoe School about? The core of Canoe School is about learning to teach canoeing. Students taking Instructor-level courses are expected to come with the requisite paddling skills for the level they are hoping to achieve. Successful candidates will be granted Paddle Canada certification at the level they attain. The skills courses present an opportunity to learn advanced canoeing techniques rarely offered through other instructional schools. But Canoe School also offers basic courses for those just starting out. It is an opportunity to be completely immerses in canoeing at one of best teaching facilities in the country. Anyone interested in becoming a Paddle Canada certified canoeing instructor. 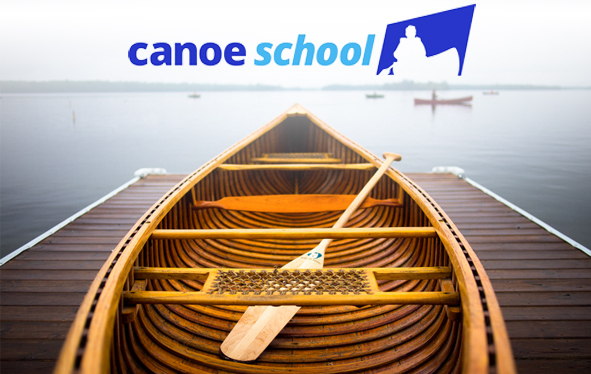 Whether you are interested in being a professional canoeing instructor, teaching at camps or other youth and adult organizations, or work as a guide where clients may need professional training, Canoe School is for you. Canoe School is also for those wanting to challenge themselves by taking skills that are an asset for canoe tripping, white water paddling or just being able to make a canoe move in ways you never thought possible. When and where is Canoe School held? Canoe School is held over the May long-weekend, starting on the Thursday evening and ending on the Monday afternoon. It is an intense 4 days of instruction. Manitoba Pioneer Camp on Shoal Lake has been the home for Canoe School for more than 20 years. Room and board are provide so you can concentrate on learning and paddling. It is an ideal teaching venue at a beautiful facility.